Quick Auctions is an auction tool to help speed up auctioning large quantities of items, especially canceling. While primarily Quick Auctions is built for large quantities of items, it can work fine for a few auctions as well. A bit of tweaking is required to get optimal settings, but it is very flexible and smart enough that you can use it for more than just mindlessly undercutting auctions by 1 copper every time. 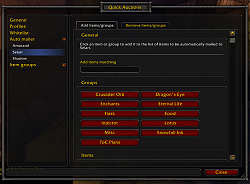 Summary window and craft queues are included so you do not have to memorize every item and quantity you need. Shows total materials required to craft as well as allowing you to click from the craft queue to craft so no searching through everything. A lot of time went into Quick Auctions, donations are appreciated but not necessary. And it's cheaper than buying gold while not being against the ToS! 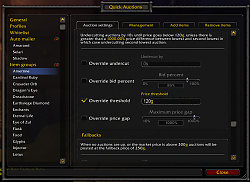 Groups are how you manage what items should be managed by Quick Auctions. 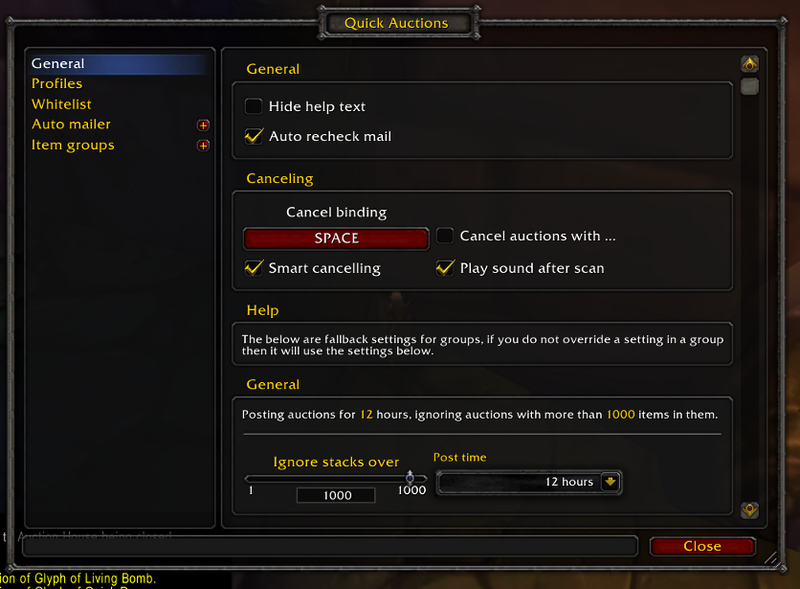 You can set auction settings either as a default, or per group giving you flexibility over everything without having to duplicate your settings 50 times. There are no limits to how many items can be grouped, see the configuration in /qa config to set them up. 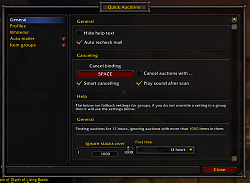 Includes a timer in the top left of the mailbox indicating how much time before new mail data becomes available, and if you are not using Postal then QA provides its own auto looting for mail. The auto looter will work with the timer on the mailbox cache so it will loot everything, wait until new mail is available and then keep looting. 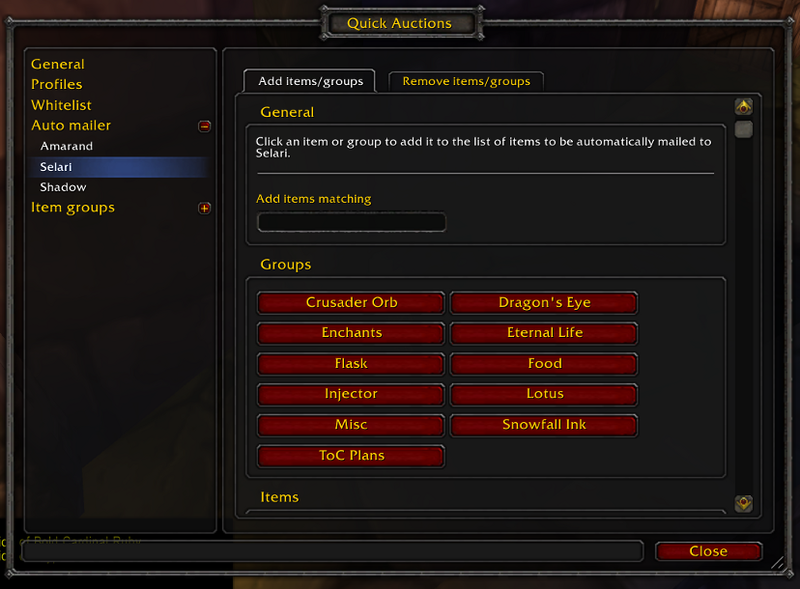 Auto mailing can now be done per item or per group to any character you want. For example, you can setup your banker to send uncut gems to your jeweler and you can setup your jeweler to send cut gems to your banker. The auto mailer is intelligent in when it sends mail off, and works best when using QA mail looter. If you are trying to loot herbs from your mailbox while auto mailing them to your scribe, it will send mail off whenever it sees your inventory is full. Basically, if you have 4 open slots it will auto mail/loot with only 4 slots, no more clearing out your bags to loot mail anymore! What changed between 2 and 3? While the configuration in QA2 was an improvement over the original QA, it still wasn't good enough. QA3 has a rewritten configuration and should be much easier for people to understand and use without having to learn to use QA through trial and error. Scan speed has been increased quite a bit again and has been tightened up to reduce the chance of conflicts. In previous versions, QA would Query -> Wait 0.50 seconds -> Check Data -> Either parse it or wait 0.50 seconds, this made sure that whenever auctions were scanned all data was available including who posted them. The problem is, most of this data becomes available instantly after your initial 1-3 seconds. In 3 it's been changed: Query -> Check Data -> Wait 0.50 Seconds -> Parse or wait 0.50 seconds. Best case this means you will save 0.50 seconds per query (50 seconds/100 items), and worse case you won't see any speed increase. Mail has been improved to make life easier for people, both a mail scrapper and a smarter mail sender were added. See the mail section above for more information. Setting scope was improved, most basic options in QA including group settings have been moved to the global profile while server/faction specific settings can still be changed per profile. Letting you setup different profiles of how QA should handle different groups, without having to duplicate all of your group list over and over. QA3 isn't done yet, and I have more planned still like summary improvements and easy buying of items. it is extremely slow after 5.4 patch. 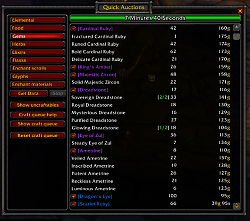 I just got back to using Quick auctions after a year and a half or so without playing with the AH, but my summary window refuses to show anything (spesifically gems, but dosent seem to show anything for any other category either). After waiting out the "Get Data", a scrollbar does however appear, as if there were data being displayed (I can scroll down), but the window is still blank. Anyone have any idea what causes this? 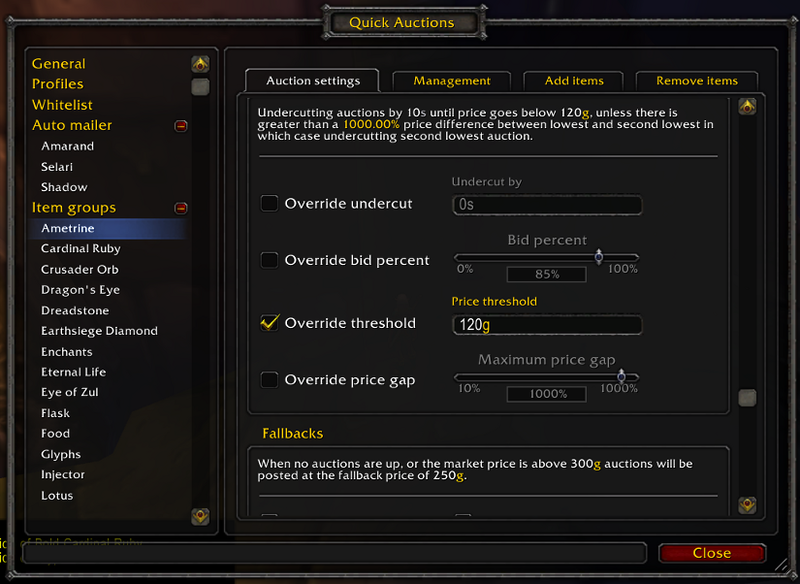 I do use auctioneer as well, but tried to disable it in case there were some addon-crash. 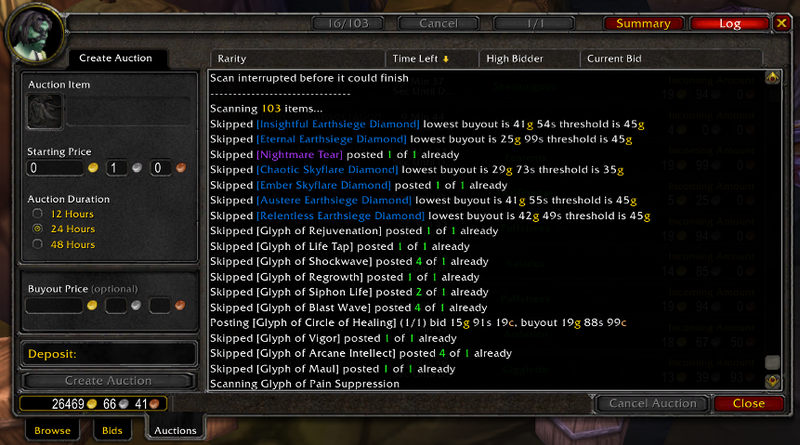 I guess maybe there is some addon that prevents the information from showing, but I have no idea which one it could be. In addition, I was wondering why you have to confirm posting/canceling of gems now. I seem to remember from last time I used the addon that after you pressed the post/cancel button, you would automatically post/cancel what should be posted/canceled (based on your settings etc) without having to confirm it. I cant seem to find an option to remove this confirm dialogue. Is there one? Last edited by gemt : 12-12-11 at 12:49 PM. It said "The specified file was not found." when I tried to download the current version. the last version can support macro for starting posting. but, after 4.3 release .. there is no way to find the clicking position. Last edited by dariding : 12-05-11 at 12:37 AM. After I click on post it queues all my glyphs but doesn't post them, am i doing something wrong? is there Quick Auctions's source code ? Does someone know how "marketprice" is obtained ? So useful. Thanks a lot for creating this. APM 1.0.7 works fine for me 1.0.8 ended up in some lua errors. If you are having issues with APM please post in the comments for that addon (http://www.wowinterface.com/download...18241#comments). Try redownloading v1.0.8 and if it doesn't work make a comment on the APM comments with the lua error and I'd be happy to help fix it. 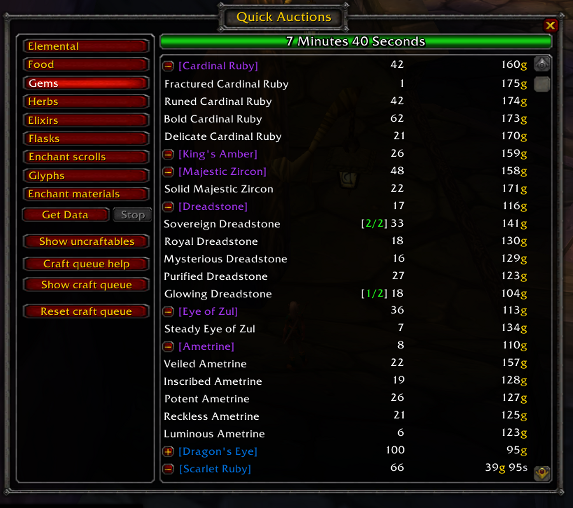 This is an issue with APM (a continuation of QA) so should be posted in a comment on that addon. There are instructions in the description for APM that detail how to get your settings transferred over. Last edited by Tymesink : 10-12-10 at 04:48 PM. I plan on stepping up to take over QA3 now that Shadowed has released the rights on it. Let me know if you have any problems through comments (on the APM page not this one) or PM. EDIT: APM has been CONFIRMED WORKING on the 4.0.1 PTR! Check back often at the link above for updates in the days to come. Last edited by Sapu94 : 10-11-10 at 11:23 PM.